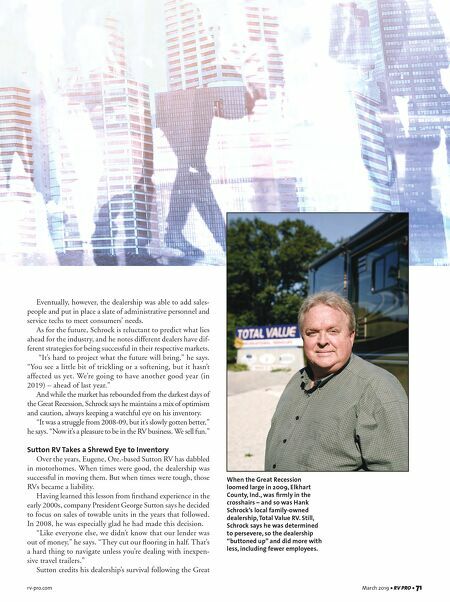 rv-pro.com March 2019 • RV PRO • 71 Eventually, however, the dealership was able to add sales- people and put in place a slate of administrative personnel and service techs to meet consumers' needs. As for the future, Schrock is reluctant to predict what lies ahead for the industry, and he notes different dealers have dif- ferent strategies for being successful in their respective markets. "It's hard to project what the future will bring," he says. "You see a little bit of trickling or a softening, but it hasn't affected us yet. We're going to have another good year (in 2019) – ahead of last year." And while the market has rebounded from the darkest days of the Great Recession, Schrock says he maintains a mix of optimism and caution, always keeping a watchful eye on his inventory. "It was a struggle from 2008-09, but it's slowly gotten better," he says. "Now it's a pleasure to be in the RV business. We sell fun." Sutton RV Takes a Shrewd Eye to Inventory Over the years, Eugene, Ore.-based Sutton RV has dabbled in motorhomes. When times were good, the dealership was successful in moving them. But when times were tough, those RVs became a liability. Having learned this lesson from firsthand experience in the early 2000s, company President George Sutton says he decided to focus on sales of towable units in the years that followed. In 2008, he was especially glad he had made this decision. "Like everyone else, we didn't know that our lender was out of money," he says. "They cut our flooring in half. That's a hard thing to navigate unless you're dealing with inexpen- sive travel trailers." 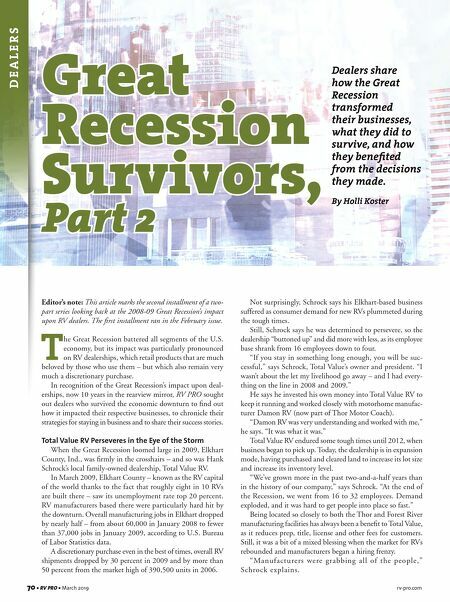 Sutton credits his dealership's survival following the Great When the Great Recession loomed large in 2009, Elkhart County, Ind., was firmly in the crosshairs – and so was Hank Schrock's local family-owned dealership, Total Value RV. Still, Schrock says he was determined to persevere, so the dealership "buttoned up" and did more with less, including fewer employees.